wargaming in 28 mm and sometimes smaller: "Les pinceaux de la guerre"
"Les pinceaux de la guerre"
The La Bricole is holding a painting competition. This is a small but growing forum of devotees of the Les Guerres Napoléoniennes. The rules are here and all are invited to compete, the deadline for entry is the 25th January and the final submission has to be in March 31. I am entering a unit of Calpe Prussians. I am also entered in the Analogue Hobbies 2nd Annual Painting Challenge, so I am up to my neck in paint. 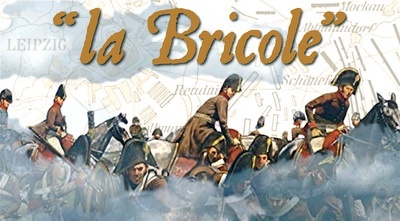 For the La Bricole Competition I am painting a 12 figure unit of the 6th Neumark Dragoons. Here they are in their unpainted glory all set to be sprayed with a glorious white undercoat. They have a light blue uniform with pink facings. Sounds like fun. Anyway, I have several units of Prussians to paint, so stay tuned. Light blue with pink, can't wait to see these painted up!!!! Have fun! Quite a task you've set yourself John but I'm sure they'll look great - a very colourful regiment, particularly for Prussians. I'm sure you'll enjoy it, Calpe are wonderful figures. Happy New Year to you.